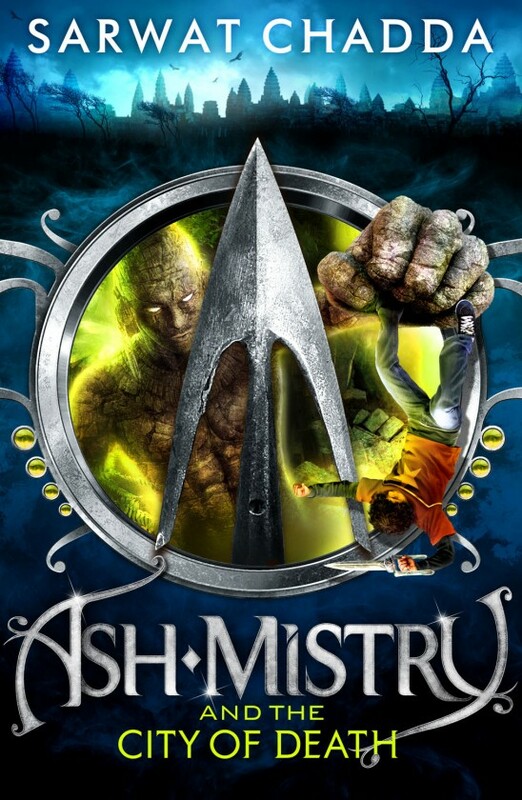 When I found out Ash Mistry and the City of Death, the second book of Sarwat Chadda’s popular Ash Mistry series was published in the UK, I was hoping that the US release (The City of Death) would soon follow. But I was deeply disappointed to find that I’ll have to wait until October 2013 for the US release. Oh heck naw! Badassery has been promised, appetite has been soaked through, and there was no way under the ever-loving sun I was waiting until the end of the year to get my grabby hands all over a book I’m desperate to read NAAOOWWW. So I did the next best thing, I ordered my very own awesome copy from the UK which arrived in my mailbox in pristine condition Tuesday March 5th, 2013. I was more than ready to be a part of Ash’s roller coaster adventure. And if you must know, the answer is yes, made up or not, badassery is a real word. This time around the book’s plot promised action, badassery to the Nth degree all because fourteen-year-old Ash is now the complete embodiment of the Kali-aastra. He’s “British by birth, Indian by heritage, and Hero by accident,” and he “can kill any living thing with a touch.” Now that’s a VIP invitation to an amazing escapade, and I had to be there. My whole being demanded instant gratification, I had to comply. But before you go any further dear reader, here’s my review of the first book The Savage Fortress (UK title: Ash Mistry and the Savage Fortress). After Ash’s mind-boggling, brain-searing, rebirth-from-death experience in India, he and his sister Lucks return home to London where for the time being they and their parents are safe from the clutches of Lord Savage who isn’t aware that Ash is alive. But, after a normal, hellish school day where Ash tried to ask his dream girl Gemma for a date to the Guy Fawkes bonfire, his nice normal life is suddenly interrupted by a visit from a half-human, half-rakshasas Parvati, the daughter of the noble warrior god Ramayana and her tiger-rakshasas companion Khan. And this time around, these ancient rakshasas, demons thought to be either non-existent or long extinct depending on whom you speak to, need Ash’s help. Ash’s experience in India had turned this once cuddly boy into a razor-sharp, living, breathing, death dealer who is well versed in the ancient Indian martial art of Kalari-payit, can “leap tall buildings in a single bound…do five impossible things before breakfast, six at the weekend,” and knew all the finer points of “Marma Adi, the 108 kill points” all living things possess. Ash had become a force to reckon with, his entire body a lethal weapon, he is the Kali-aastra. But as amazing as all this power is, when you’re fourteen and going through the body-changes brought on by puberty, and struggling with the rights and wrongs of life, there is a sudden need to make sure the two sides of your personality don’t explode at the worst possible time or in the most humiliating way. Chadda is the kind of author who isn’t afraid to write from his heart and soul and infuses his work with refreshing humor that puts the reader at such ease that I was unaware how far I’d gotten into the book before sleep beckoned. Before my first night of reading was through, I’d experienced intense laughter, one heck of a fight scene, an unfortunate death, and a serious fracture in the Nerd Herd friendship, all by chapter ten. Having experienced a terrible nightmare where he almost did the unthinkable, Ash decides to accompany Parvati and Khan back to India to kill Savage. In Ash’s mind, this is the only way his family can have any kind of life free from constant danger and quite frankly, he owes them that much. Lucks is terribly afraid for her brother and tries to convince him to let it go but Ash feels so strongly he’s doing the right thing that he’s willing to disappoint his beloved sister and fool his parents. This time the stakes are much higher than they’ve ever been because Lord Savage doesn’t just want to acquire more magic, he wants to posses the ultimate magic – the power to rule the world. But Ash, Parvati, and Khan know that they must do everything in their power to stop Savage and save the world. Full on action, amazing adventure, danger at every turn, and a bevy of twists and turns that leads the reader like an eager child through the candy store, to the badassery of climaxes and a final OMG-you-can’t-leave-me-hanging-like-this chapter that had me begging the author via Twitter for the third book in the series. Fortunately, I only have a little less than four months until the July 2013 release of book 3 Ash Mistry and The World of Darkness. Yes, I’m that desperate and no I’m not ashamed! I love this book. I finished it in three days. I admit I was trying to pace myself, to absorb the story at a normal pace which for me is about a week. But all that went out the window and I found myself steeped heavily in mystery, murder, and mayhem. My fingers seemed to find their own rhythm and turned pages of their own accord, my brain was in tandem, the story enveloped me, filled me with adrenaline, I laughed and cried, it is un-put-downable. A funny, thrilling, heartbreaking death-defying story for all ages. This entry was posted in Books, new release and tagged action/adventure, badassery, DRAMA, Indian history and culture, ya. Bookmark the permalink.